Phillip // I arrived at Gameday to see the Lakeside Patio packed with fans. The energy was electric with an hour left before the show was to start. I was lucky enough to have a pass for the Coca-Cola fan experience, along with other UM students, to avoid the line and get a great view of the stage area. Phillip // The show begins with loud cheers and chants of “It’s Great To Be a Miami Hurricane.” My voice, lost among the crowd. From that point on, the camera pans over the crowd showing all the Barstool certified signs made by fans. My picks: the touchdown Jesus and also the Pickle Richt sign as well. The show went on throughout the morning, revealing that Alex Rodriguez would be the celebrity guest speaker. Thalia// I got to Gameday doned in my orange and green best a little after the show had started. I headed to the Pit, hoping to be able to get in on the action despite not getting there at 5 o’clock that morning. Luckily, they were letting almost everyone in at this time and I got in fairly quickly. Once inside, I began to understand what Gameday was all about. The school spirit was apparent and everyone was pumped and ready for a Canes win. I spent time reading signs and and trying to sneak my way closer to the stage. Thalia// Finally close enough to see what was happening, I began to get in on the action: cheering my hardest, waving my orange and green pompoms, and holding up the U approximately every .5 seconds. The band seemed to be playing better than ever and with more passion than I have ever seen in my time at UM. I was slightly confused why students from schools like FIU, UCF, and FAU were there holding up signs, as the rivalry was between UM and Notre Dame (no shade though). Phillip // A-Rod came through the pit and then onto the stage to join the crew in picking the winners for the games of the day. Thalia// It was hard to hear what the announcers were saying from the Pit, but I was able to see the smoke go off near the Student Center. My initial thought was “Wouldn’t it be cool if A-Rod ran through it?” and then a couple seconds later, my thoughts became a reality as he rushed out of the smoke. 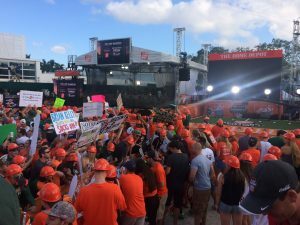 The energy of the crowd was the highest during the picks, especially when A-Rod and Heisman trophy winner, Desmond Howard, picked the ‘Canes for the win. They also booed and cheered loudly when Corso went against the U (41-8 though…). 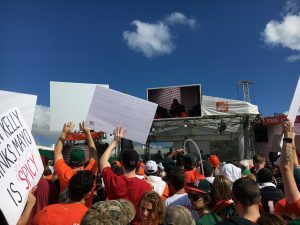 Phillip // The most memorable part was after the show was over the announcer Rece Davis announced to the crowd that if we showed the same kind of energy in the stadium as we did during Gameday, the Canes would win. He couldn’t have been more correct! Chabo // Since I had some studying to do, I was not able to attend Gameday (when procrastination snaps back). I did, however, livestream the show from the library. In my three years at the U, I had never seen the campus more packed than on that day. Alumni Weekend was just the week before and the Gameday crowd made that look like your average day. The energy was amazing, the signs were hilarious, and the show was mostly on the side of Notre Dame (awkward). Thalia// As a senior, I felt so lucky to be able to attend Gameday at the U. 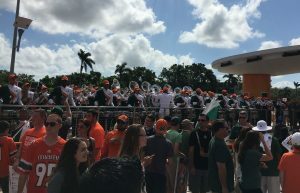 It was great to see the University of Miami community come together and be excited about the possibility of winning such a big game. 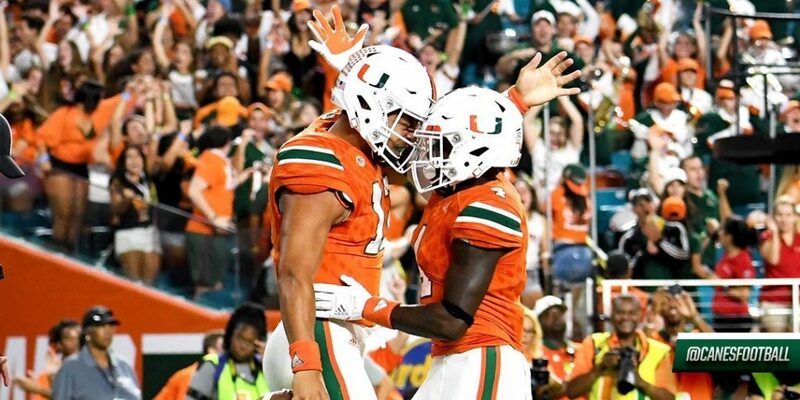 Before coming to UM, I was never really a sports person, but the spirit of Miami football has changed me into a serious sports fan. Catch me in North Carolina, December 2nd cheering on the Canes. Opinion: Are the Convicts Back?